"Dramatic critics hear a pianist", article from Literary Digest 1923.
enough to begin with his newly discovered straight-wrist technique. The favored boy is Virgilio Pallotelli. Par 2 "He is the greatest Chopin player in the world, they say. He certainly has marvelous dexterity. His hands ripple and flash along the keyboard with uncanny accuracy, and they produce a beautiful sound. He began the nocturne in B Major, No. 1 of the thirty-second opus. It is lovely, gentle, wistful Chopin. And after a particularly lovely phrase, Mr. de Pachmann said, 'Listen!' and played another, lovelier one, and wagged his head comically and waved his hands and grinned at the audience. And everybody laughed heartily. And he did the same with the second impromptu, and with the B minor prelude, and with the Allegro de Concert in A major. Par 3 "And then there was more applause, and another funny little speech, and a final group of Mendelssohn, Schumann and Liszt. But one didn't hear that. For one had gone out, feeling a little ashamed of caring so much about music in a world where so many excellent people didn't mind a bit what happened to it." Par 5 "Perhaps we will express ourself more clearly by saying that we think art ought to be exciting. And to us de Pachmann is essentially that. Sometimes he is irritating and distracting, but he is not dull. Par 6 "Nor is he to us in any sense comic. It is true, of course, that he seems to be instinctively rebellious against conventional manners of the concert hall. He is not reverent in the usual fashion. 'Beethoven died and went to hell,' was among the comments of Deems Taylor about de Pachmann, but we are not at all sure that the phrase carries the full weight of condemnation which Deems Taylor intended. Beethoven probably enjoyed the reversal of the usual process of the concert hall. There are more than enough musicians who play as if Beethoven were in heaven and had never been elsewhere. Par 7 "'Three thousand people saw murder done last night in Carnegie Hall,' wrote Taylor. And it seems to us that even this may be construed into a compliment, for, after all, the musician who regards the master composers as live enough to be worth killing pays them a far higher tribute than other pianists who gloomily commune with wraiths of men long dead and buried. Par 9 "Now, we defy anybody to produce a pianist more obviously and convincingly excited about music than de Pachmann. He doesn't think of the composers as dead men in their vaults. He burns with hatred of rival pianists who have been dust for fifty years to everybody in the world but de Pachmann. 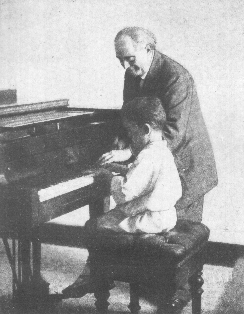 He talks of and to his good friend Liszt as familiarly as he talks to God. Par 10 "And most of all do we deny that de Pachmann is comic. That curious contortion of the mouth which Deems Taylor reported as a grin is instead an attempt of the little man to gulp down an overpowering ecstasy. It is true that people in Carnegie Hall laughed, but whenever people gather together in groups of more than ten or twelve they invariably seize upon the strange as the equivalent of the comic. Par 11 p.29 "If de Pachmann's method of combining pantomime, reminiscence, spoken thought with piano music is wholly unsuitable to the conditions under which big concerts are held, then the artistic flaw is less in him than in the conditions. It is the 3,000 who are out of step. There is something essentially gross and unwieldy in the effort to make a piano serve 3,000 at the same time. Music at its finest must be far more intimate. Of course, it may be said that de Pachmann, having accepted and even courted the conditions, should live up to the rules. We suppose he is in nowise horrified or displeased at the vast rewards of great and crowded concerts. But there is something instinctive in him which rebels against the conditions for all that. He makes an effort to draw the thousands closer. Even the Pied Piper himself, the most seductive musician recorded in history, probably gestured now and again and cried out to some single child in the crowd." Par 13 "De Pachmann seemed to us to be caressing that piano and to be evoking from it a voice of gold, but then, too, there was Chaplin at that piano, there at times was such brilliantly expressive pantomime as that with which Paul Clerget glorified the Ames revival of 'L'Enfant Prodigue.' There was Déburau himself. Nay, there was Pierrot grown old and free and given to talking to the moon. Par 14 "As every one knows, de Pachmann, with many winks, chuckles, groans and appeals to heaven, keeps up a continuous, murmurous chatter about the music he is invoking. To himself, to the spirits of the dead, to any within range of his half-whispered monolog, he talks about that music, about how it came to be written, how Liszt played it, how he hopes to play it, how beautiful it is, etc. It is chatter which only a few can hear distinctly and of which the eccentricity sets the remoter or more woolly witted auditors into a fit of the giggles. If you are nearer you see how the moods of the melody—fear, hope, anger, love, gaiety, despair—write themselves on every aspect of his mobile face, in every line of his responsive body. If you are nearer still you can hear enough to know he is now exultant in a free and childlike way at his own astonishing dexterity, now mortified at his own shortcomings, now grateful to whatever god brought the wonder of music into an ugly world. Par 15 "He is thinking aloud—or, to be more exact, feeling aloud. A difficult impromptu of Chopin may be before him. He wonders if he will play it well. He prays he will. It will tax his memory, and, after all, he is an old man now, a shrunken old man of seventy-five, whose memory is not what it was. But, come, come, de Pachmann! Mere music teachers can memorize. What counts is intelligence. Courage, de Pachmann! 'Dear God, help me to play this beautiful music to-night as You meant it to be played when You sent it into the world.' Fragments of something like this escaped from the little man as he served at that altar on Carnegie's stage. Par 16 "Such communicativeness in the world of affairs or on the concert platform may be an infirmity, but, after all, it is a part of de Pachmann, and one did not come away from Bernhardt's last 'Camille' denouncing her for being a grandmother with a wooden leg. It is barely possible that de Pachmann could be made by a grim management to keep his behavior orderly, his face straight, his mouth shut. But probably he would burst. Par 17 "To those sitting further from the stage it may be—nay, it must be—maddening to have the most delicate transitions of the Chopin nocturnes drowned in the empty laughter of giggling neighbors. But it was the whole implication of the more ferocious reviews yesterday that these 'antics,' these 'monkeyshines,' these 'capers' were the tricks and manners of an old showman who was going to attract an audience by fair means or foul. But really weren't they rather the candors of an artless and quite simple person who would have behaved in exactly the same manner had the hall been empty, and who would have had just as good a time alone with the composers? Many of these 'monkeyshines' were prayers, for de Pachmann was not talking to A-2, A-4, A-6, A-8. He was talking to God. Par 18 "Mr. Taylor did not stick it out. He went away in distress, 'feeling, a little ashamed of caring so much about music in a world where so many excellent people didn't mind a bit what happened to it.' [see Par 3.] Well, that makes two of them, for, tho the implication is rather to the contrary, we have a suspicion that there was another person in Carnegie Hall that night who cared as much about music as ever man cared since the first note sounded across the void. The other man's name was Vladimir de Pachmann."